BLINDS > ROLLER BLINDS OR ROMAN BLINDS? Roller blinds and roman blinds are two of the most popular designs used in modern homes. Roller blinds are made from a stiff, sturdy fabric that hangs flat when the blinds are lowered, and are raised using a spring roller mechanism. Roman blinds, on the other hand, have slats or dowel rods in them, which help to form soft pleats when the blinds are raised. Roller blinds are blinds which have a spring mechanism, or some beaded side controls, that allows them to roll up or unroll to cover the window. They are made from a specially treated, stiff fabric, and will unfold to cover the window, then roll up onto themselves to let light through when necessary. Roller blinds can be semi-sheer, or made from a thick blackout material, making them suitable for use in a bedroom. 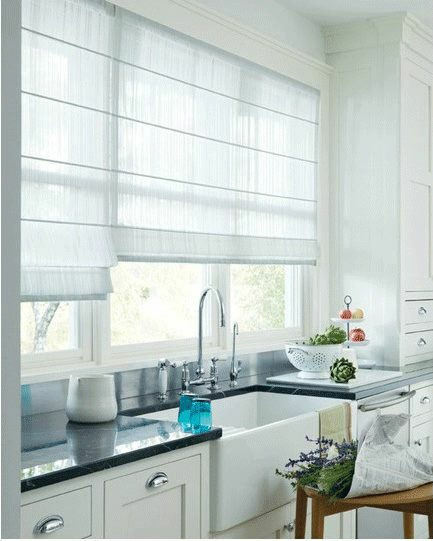 Roman blinds are a form of pull-down blind that closes by folding upwards onto itself. They are neater and use less fabric than curtains. Because they are more compact, you can usually purchase luxurious, high quality roman blinds for a comparatively low price compared to equivalent designs of curtains. It’s important that you choose roman blinds with a high quality mechanism. These blinds usually have a cord that hangs down on one side, and pulling this cord will cause the blinds to unfold or curl back up. Modern roman blinds have a safety device secured on the cord that will prevent a person from getting entangled in it, and potentially choking. It is essential that you leave that safety mechanism in place because it could save lives. Roman blinds can be made from either a semi-sheer material, or a thicker woven material that will let less light through. If you want a full blackout look, then you may want to use a blackout fabric behind the blind. Which is More Expensive – Roller or Roman Blinds? 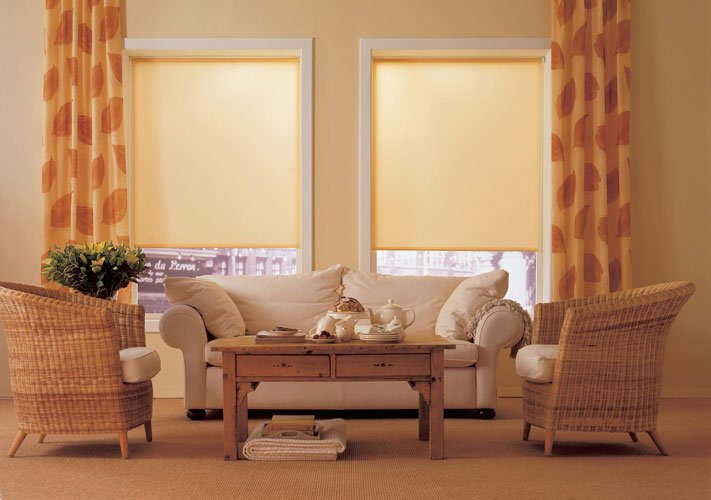 Both roller blinds and roman blinds are offered at a range of different price points. The cost of the blinds will depend on how big you need them to be, the quality of the mechanism, and the type of fabric that the blinds are made of. In general, roller blinds tend to have a wider range of budget offerings available. Because of the nature of the mechanism, and the extra rods/slats required to make the folds, roman blinds are usually slightly more expensive. It is possible to find good looking blinds in both designs without spending a fortune however, if you know where to look! Both Roman blinds and roller blinds are a good choice for rooms with small windows, or rooms that are long and have several windows in them. Curtains tend to ‘cut up’ a room and can make it feel smaller than it is. Blinds, especially ones that sit on the inside of the window, offer a smoother and neater appearance, and will subtly accent the room, instead of breaking it up. Matching your blinds to your soft furnishings is one way to make the room look more “put together”, and to give it a professional, polished appearance. Smooth, simple roller blinds with curtains on either side, matching the throws, cushions or duvet covers in the room can be an effective choice. Roman blinds offer a softer and more textured appearance, and look particularly stunning in dens, living rooms and studies. Where roller blinds tend to be more understated and simple, the texture of a Roman blind goes well with bolder patterns and brighter colours. Patterns and stripes work well on Roman blinds because the rigidity of the dowel or slats helps to keep the blinds flat and straight. The same patterns could get lost in the folds of curtains, or look too strong on a completely smooth roller blind. To give your blinds a little extra pop, consider using some contrasting trim along the base of the blind, or adding a small hood to the top of the window, to ‘frame’ the blinds. Remember that if you have a small window and want to let the maximum amount of light into the room you should place the blind as high as possible – either at the very top inside the frame, or, ideally, above the frame with the blinds having a little overlap on either side. This will ensure that when the blinds are fully raised, they won’t be blocking light from entering the room. Using an upholstered blind with a box pelmet will ensure that when the blind is drawn, it will not let any light through, but that when it is raised, it will not block out any light. If you’re lucky enough to live in an older property with elegant sash windows, then Roman blinds can turn those windows into a stunning focal point. They will pull your eye to the window and the view outside, and they make the area a nice place to relax when the blind is drawn. Choose a fabric that is similar in style to the upholstery in the room, but not identical, so that you can enjoy a neat and uniform pattern that isn’t too “clinical”. Many homeowners opt for curtains simply because that’s what they’re used to. Making the switch to blinds can seem like a huge change, but it’s actually surprisingly simple to find something that will complement the decor already in your home. Why not request some swatches of the different blind fabrics that you like the look of, take them home, and see how they look in your living room, bedroom or kitchen. The lighting in your home can make a huge difference to how things appear, and you find some inspiration for the perfect design.